I’ve updated the list of Twitter accounts for the 115th Senate, which starts tomorrow, 1/3/2017. As the new senators get settled in, they will probably shift their Twitter usage from campaign to official accounts, and as those come online I will update the list as appropriate. It’s been raining all Sunday, which killed my plans for the day. So I grabbed something off the back burner: what the heck are the senate candidates doing for their web sites? The amazing thing is that almost all candidate web sites look alike these days. Splash screen asking for money. Then into the main site: Big photo on the top, sometimes with several pictures rotating through, showing the candidate. often with adoring voters. Buttons for social media, making a donation, and signing up for news letter on the top or down a side. Tweets/Facebook Likes somewhere. A menu bar with 5 or so choices. Dark (usually blue) borders on the left and right framing the content. Some text about why the candidate is the very best one could have ever hoped for. I’ve added Dave Weldon into the list starting 6/16; he’s not making much of a splash so far, but let’s see where he goes. Connie Mack’s Twitter activity is like Tigger: bouncy bouncy bouncy. Endorsements keep rolling in for him, and his focus has to be shifting to the general election. 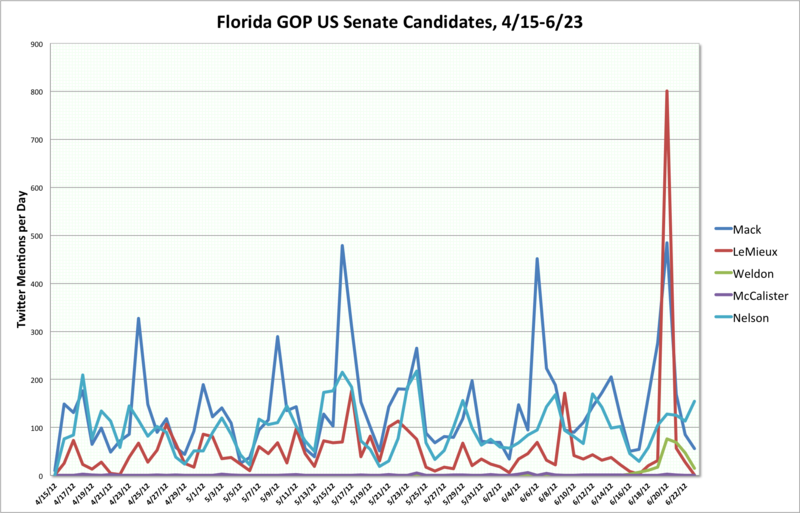 But there’s still not a lot of mentions of Bill Nelson in tweets about Mack, so November is not yet on the public’s radar. McCalister, on the other hand, has flatlined. I actually panicked for a moment thinking I must have missed his pulling out of the campaign. But no, he’s still there. Twitter was never his thing, to be fair. 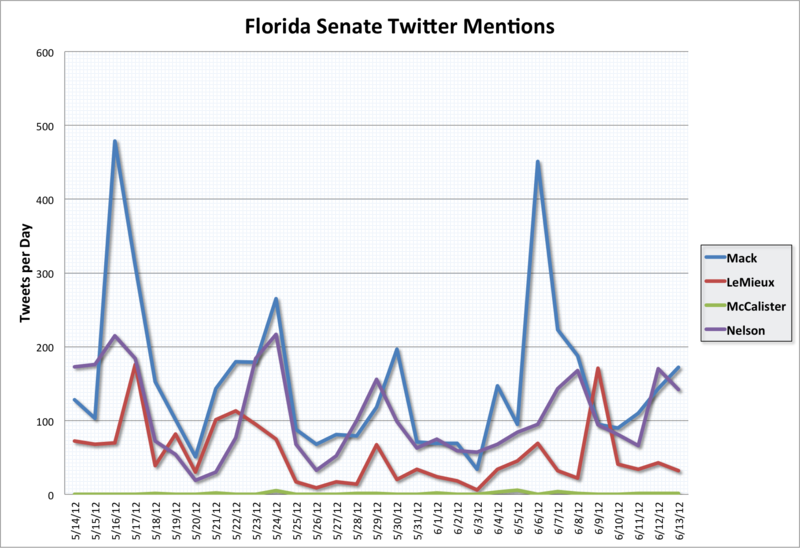 George LeMieux is still around, but he too almost lost his pulse on Twitter until the Florida Federation of Young Republicans annual conference produced a surge of activity. Now days, I think his name is mostly mentioned in the context of Charlie Crist and the Jim Greer trial. George is stuck with Charlie like some sort of bad buddy movie. But all’s not well on Twitter for Mack … there’s a shadow trailing him, keeping up but keeping his distance. That shadow is Bill Nelson, waiting for the general election cycle to get under way… Let’s see what happens with him towards the end of August.